HomeHistoryFactsWhat is the Proper Way to Wear a Samurai Sword – Blade Up or Down? 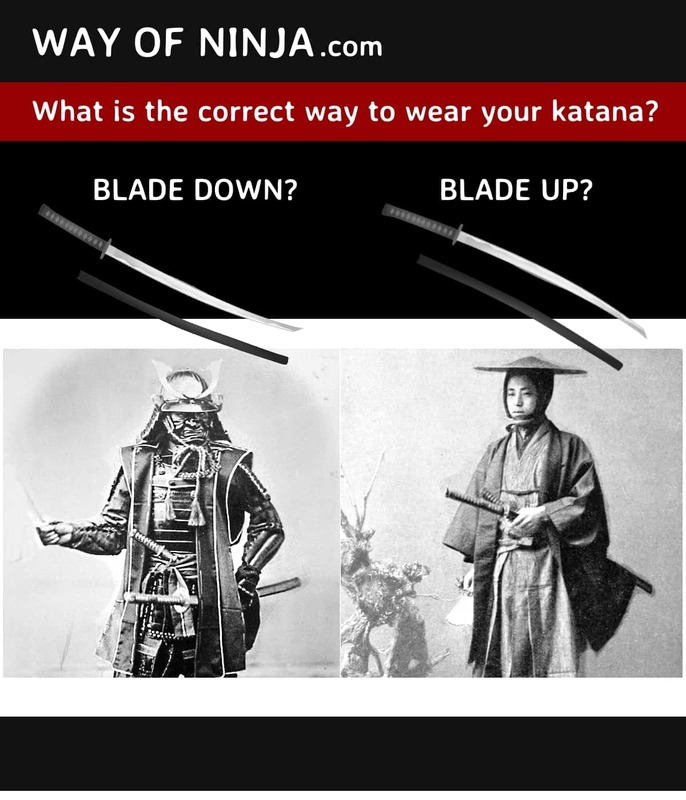 What is the Proper Way to Wear a Samurai Sword – Blade Up or Down? The samurai can wear his sword any way he wants to, since there are no laws dictating sword fashion in feudal Japan. But does that mean they would? Exercising your freedom of “sword fashion” for any reason other than combat function is certain death. Of course, the samurai weren’t afraid to die due to their ingrained values from Bushido, but losing a battle had potentially disastrous consequences to those they serve. No warrior would want that kind of disgrace. So, blade up or down? Both up and down can be the proper way depending on the era, sword-type and dressing. Samurai Sword History: How does sword type affect how it is worn? Samurai wore a combination of two swords, one long and short. The shorter swords served as backup and, in the Edo era, worn for symbolic show of power. Let’s ignore the short swords (Wakizashi and Tanto) and instead focus on the primary sword for attack and defense. Depending on the period in history, these are the main swords that samurai would carry. The Chokuto is a single-edged straight sword inspired by the ancient Chinese sword. Essentially the ancestor of all Japanese swords, it was produced and used before the 10th century. In response to the Mongol invasion, and having experienced how deadly effective curved swords were, the Tachi was forged with a curvature near its hilt. This sword would be longer than all its successors, perhaps due in part to horseback battles. Because of how it was forged, unsheathing the Tachi from its scabbard was significantly easier and swifter if the sword was worn with its cutting-edge facing down. So, a samurai who used a Tachi would always wear it with its blade facing down. Next in line is the descendent of the Tachi and predecessor of the Katana, the Uchigatana. Unlike its predecessor, the Uchigatana was shorter and had a smaller curvature. The curve was also moved to the striking tip of the sword. As a result, the Uchigatana was worn with its cutting-edge facing up. Being easier to unsheathe, it became widely used between 1336 and 1573. Finally, the Katana. Throughout its history, the Katana varied in length but on average its length was shorter than the Uchigatana. The popularity of the katana marked a shift towards close combat. Imagine the relatively peaceful Edo era. You would most likely be attacked within a room. In an enclosed space, the katana was a far better sword to maneuver. If you had carried a Tachi back then, you are more likely to strike the walls than your opponent. Just like the Uchigatana, the katana was worn with its blade facing up. During the Warring States, Japan was in chaos when domain battled each other endlessly. Battle armour was therefore the norm and so was horseback combat. While you already know that the Tachi was likely common in this period, there was another reason why a sword would be worn with its blade down. Japanese armour hampers range of movement and greatly restricts upward arm movements. Trying to unsheathe a sword while in armour would be less awkward and faster if the blade faced down. The samurai need only draw the katana by extending his arm forward. In other words, even if the armour-clad samurai used a katana (and not a Tachi), it would be worn with its cutting-edge down. In contrast to Edo era, a time of peace when Japan was unified under the Tokugawa Bakufu, the samurai would be in kimono and hakama. Without armour, unsheathing a sword in an upwards motion was possible and essential to defending against an attack. But, just for fun, what if the samurai used a tachi in kimono and hakama? The Tachi by design still has to be worn blade-side down. Why did samurai generally prefer their blades worn up? Save for the Tachi with its awkward curvature, why did samurai default to wearing swords with the blades facing up? Recall that superior combat function for sword-fashion was a priority to samurai. Human mechanics made unsheathing a sword worn with its blade facing upwards feel natural, allowing the samurai to swiftly attack from unsheathing the sword (what we modern warriors know as Iaido). Furthermore, the placement of the sword is also advantageous when parrying sudden attacks. There were no doubt other functional reasons why blade-side up was preferred. To retain the sharpness of the blade. Gravity and friction on a downward-facing blade against the scabbard can cause the blade to dull. Reduce the chance of slicing the legs or fingers when the sword collar loosens due to wear and tear. So what is the answer to this!? The question specifies that the Samurai sword is a katana, in which case, here’s the answer. When in armour, wear the katana with its cutting-edge facing down; without armour, wear the katana with its blade facing up. But does it really matter how you wear the sword, if your samurai costume is similar to what you see below? Haha! Hmm… is this even a samurai? Kapp, Leon, and Hiroko Kapp. Modern Japanese Swords and Swordsmiths: From 1868 to the Present. Tokyo: Kodansha International ;, 2002. 18. Nagayama, Ko. The Connoisseur’s Book of Japanese Swords. Tokyo: Kodansha International, 1997. 21. “Samurai Fashion Guide – Should You Wear Your Sword Blade-up or Blade-down?” RocketNews24. June 22, 2015. Accessed October 28, 2015. http://en.rocketnews24.com/2015/06/22/samurai-fashion-guide-should-you-wear-your-sword-blade-up-or-blade-down/.